Nissan now has a car to go with its electric powertrain. At the opening ceremony for its new headquarters in Yokohoma, Japan, the company unveiled the Nissan Leaf, a battery-electric vehicle that will hit U.S. roads in 2010. We’ve driven test mules wearing both Cube and Versa sheet metal, but this latest announcement is the final step in turning an engineering project into a production car. The Leaf shares its general shape with the Versa hatchback, but is notably longer than that car. Cues are also borrowed from the Murano crossover and the Asian-market March subcompact. Nissan’s chief creative officer, Shiro Nakamura, says the car shown is almost identical to the production model that will arrive in the U.S. Inside, the cabin has style at the top of the compact car segment. The two-tier instrument panel uses digital screens rather than traditional gauges. A gloss black surround and sleek flush-mounted buttons accent the navigation system in the light interior. The traditional shift lever is replaced by a small knob that is pushed forward or back to select drive or reverse. Nissan Leafs (Leaves?) will be offered to commercial fleets in the U.S. in 2010. By 2012, the LEAF will be offered to consumers in select markets, including Oregon, Phoenix, Raleigh, San Diego, Seattle, Sonoma, Tennessee, Tucson, and Washington D.C. Nissan says the price of the EV will be close to that of a family sedan, which we take to mean somewhere near $25,000 to $30,000. To ease early adopters’ fears about costly replacement, Nissan will likely lease the battery pack. The company is still debating if the car itself – the body, the chassis, and the powertrain – will be leased or sold to customers. The Leaf is powered by an electric motor making 80 kW (107 hp) and 206 lb-ft of torque. Electricity is stored in a 24-kWh lithium-ion battery pack. The Leaf will have a range of about 100 miles between charges. In the home, a 200-volt system will recharge the car in eight hours. Nissan is also working with governments and utilities to install charging stations in major markets. Some of those stations would use a three-phase 200-volt power supply to charge the battery to 80 percent in just 30 minutes. To aid drivers in making the transition from gas vehicles to range-limited electrics, Nissan will connect the Leaf with drivers through their phones. Using that system, consumers would be able to check the battery charge or turn on the climate control several minutes before getting into their car. By cooling or heating the vehicle while it is still plugged in, drivers can conserve the battery charge to ensure they get the best range. Leaf drivers will also have the option to equip their car with a small solar panel on the rear spoiler to power some accessories when parked. 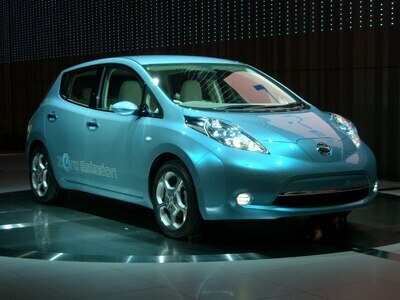 For Nissan, the Leaf represents a strategy to be a leader in zero-emissions technology. To date, the Japanese automaker has been a minor player in the hybrid game, only offering the Altima Hybrid (which uses Toyota’s Synergy hybrid powertrain) in nine states. By focusing on electric vehicles, the company hopes to leap-frog hybrid leaders and establish its own green reputation. In addition to the Leaf, Nissan plans to offer two more electrics based on the same platform within a couple years.